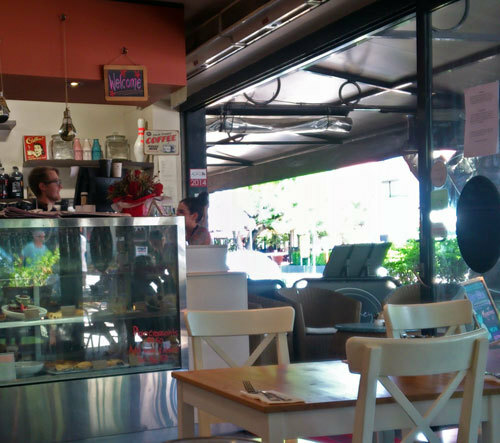 We dropped in for an early lunch to this bright and fresh eatery on bustling Racecourse Road, Ascot. 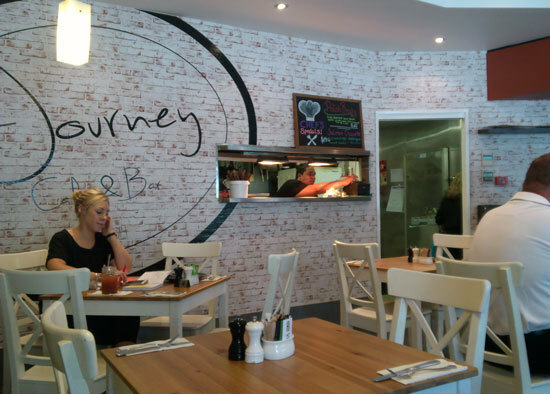 Journey Cafe and Bar has a friendly young staff, and the atmosphere is casual and approachable. There is outdoor seating, but the day being hot, we opted for the deliciously cool interior. The menu ranges from all-day breakfasts and healthy salads to filled breads and cabinet items. I chose a healthy salad - no I didn't! I had the 'American Styled Cheeseburger' ($18), which was a tall, messy item that came on a wooden board. If I ordered it again I would ask for a plate, as I had to deconstruct it to eat it and the board wasn't really adequate. I'm also not sold on the idea of wooden boards as dinner plates (or jars as glasses), but that's just me, lacking hipster cred. The burger was on a nice brioche bun, and the caramelised onion and cheese made it gooey but tasty. Uncle Chris had the blackboard chef's special, the 'Polish Breakfast' ($20), which was something a bit different, with interesting and zesty flavours. I had every intention of photographing the food for you, but when it came we fell on it like seagulls on leftover chips and had visually trashed it before I remembered. So here's another pic of the interior. Journey also has a dinner menu with some very edible-sounding entrees ($15 - $17), mains ($22 - $30) and desserts ($14 - $15). 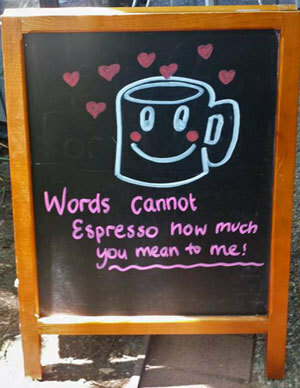 There are lots of signs and decor around the cafe referencing coffee, so even though we didn't have one, I imagine they'd do a pretty good job. The place is kid-friendly, vegetarian and gluten-free friendly and wheelchair accessible. Although it is not cheap, the food is tasty and a bit different to the standard cafe offerings.